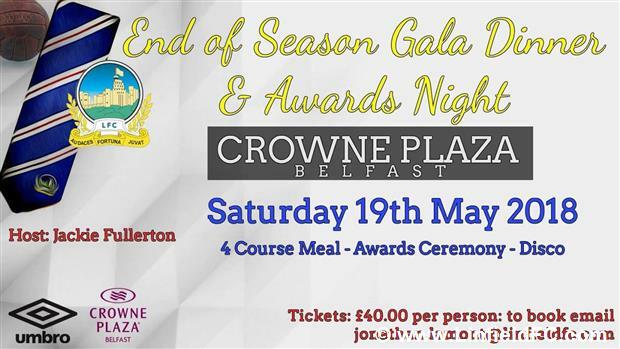 A number of special guests have been confirmed for the club's End of Season Gala Dinner and Awards Night on Saturday 19th May in the Crowne Plaza Hotel, Shaws Bridge, Belfast. Linfield Legends and former Torrans’ Trophy winners George Dunlop and Martin McGaughey will be in attendance, along with some remaining members of the famous 1961/62 seven trophy team including Isaac Andrews, Ken Gilliland, Billy Wilson and hopefully Hubert Barr. The recipient of the 2018 Torrans Trophy will also be announced on the evening of the dinner and another legendary player will be inducted into the club’s Hall of Fame. Tickets for this prestigious event, costing £40.00, can now be reserved by contacting Jonathan Lamont (jonathan.lamont@linfieldfc.com) on 07803538475. Once places are reserved, payment in full will be required by the 6th May. The compere for the event will be local football personality and commentator Jackie Fullerton and details of the after dinner entertainment will be announced in the coming week. Book your place now to join with the Linfield management, first team squad and club legends at our Gala End of Season Dinner in 2018.